The US ambassador left the Security Council chamber Tuesday at the start of a speech by Palestinian ambassador Riyad Mansour, who sharply criticized Washington's decision to move its embassy from Tel Aviv to Jerusalem in defiance of the international body's resolutions. Haley defended Israeli troops' actions and blamed Hamas and its Iranian backers for the violence on Gaza's border with Israel. "Let's remember that the Hamas terrorist organization* has been inciting violence for years, long before the United States decided to move our embassy," she said. "Make no mistake, Hamas is pleased with the results from yesterday," the ambassador added. Praising Israeli "restraint" in the ongoing border violence, Haley noted "no country in this chamber would act with more restraint than Israel has. In fact the records of several countries here today suggest they would be much less restrained." According to the ambassador, the US decision to move its embassy to Jerusalem was the right thing to do, and "reflects the reality" of the city being Israel's capital. Haley also insisted that the embassy move has no impact on the prospects for an Israeli-Palestinian peace settlement. With Palestinian UN envoy preparing his response, Haley demonstratively walked out of the chamber. During his half-hour long speech, ambassador Riyad Mansour accused Israel of "armed aggression" against the Palestinian people, and accused the US of "trampling" international law in Monday's decision. "No country has the right to place its embassy on occupied land," Mansour said, adding that international agreements, including those created at the UN, demand that the status of Jerusalem be defined in the course of peace negotiations between Israel and Palestine. "This is another decision where the US administration is totally ignoring our feelings and our legitimate rights, and the feelings of Muslims, Christians, and all monotheistic religions throughout the world," Mansour said. According to the ambassador, Trump's decision displays disregard for world opinion, including Security Council resolutions. "This is a superpower which must first and foremost defend international law, a superpower that must protect the resolutions of the Security Council as a permanent member of this body. They must adhere to international law, not wipe their feet with it," he said. Mansour in turn walked out at the start of a speech by Israeli ambassador Danny Danon. 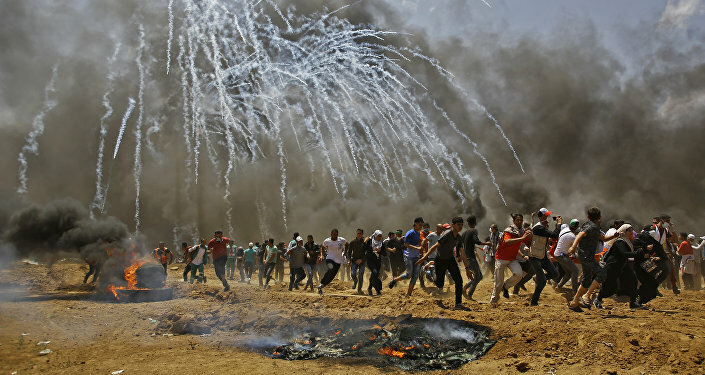 The war of words and gestures was part of Tuesday's emergency Security Council session dedicated to the deaths of over 60 Palestinians amid ongoing protests over Monday's ceremony to transfer the US diplomatic presence in Israel to Jerusalem. No joint statement or action was reached during Tuesday's meeting, with the US vetoing a draft statement prepared by Kuwait calling for an independent probe into the violence. Haley's comments, particularly her defense of the Israeli military's actions at the Gaza border, saw tension reaching a boiling point on social media, with little room for neutrality. Killing 60 UNARMED HUMANS including an 8 month old baby, a man with no legs, a paramedic & injuring 2000 more is NOT "restraint"
— 🦋 𝒞𝒶𝓉𝒽𝓁𝑒𝑒𝓃 𝐵𝓊𝓇𝓀𝑒 🦋 (@ItsMeCathi) 15 мая 2018 г.
Nikki Haley saying the American embassy has nothing to do with the violence is like her claiming she didn’t change her name from Nimrata Randhawa to please a white voting base. — Qais Shahin (@qaisshahin) 15 мая 2018 г. So it's US policy to accept shooting unarmed protestors? Do I have that right? — Essential Hermagoras Consulting (@Hermagoras) 15 мая 2018 г. And why do you have to justify the actions of another state? Can’t Israel justify these killings themselves? — Joe M. Mussala (@josmuss) 15 мая 2018 г. — SGT DOOM (@MinorityRepubl2) 15 мая 2018 г.
Trump made the decision to recognize Jerusalem as Israel's capital in December 2017. That same month, a UN resolution requiring countries not to establish diplomatic missions in the contested city of Jerusalem garnered the support of 128 countries, including Russia, China and most of the US's European allies. Washington moved ahead with its decision anyway. Speaking at the embassy transfer ceremony on Monday, Prime Minister Benjamin Netanyahu call the move "historic." *Israel, the United States and several other countries designate Hamas as a terrorist organization. Russia does not designate the group as such.